The question has been asked whether Seurat's great work should be regarded as the necessary outcome of Impressionist ideas or as deliberately anti-Impressionist, and an answer might be that it contains elements of both. In pursuing the analysis of colour, Seurat carried on, though in more systematic fashion, what Monet and Pissarro had been doing. The division of colour was scarcely new, though the primary colours were more scientifically defined by the range he based on the spectrum; but he added to this divisionism or pointillism an equally elaborate and scientifically considered treatment of line in order to attain a harmonious unity of composition, which was distinct from the Impressionist aim of suggesting light, atmosphere and movement. The difference is more readily perceptible in a figure composition as here than in landscape. 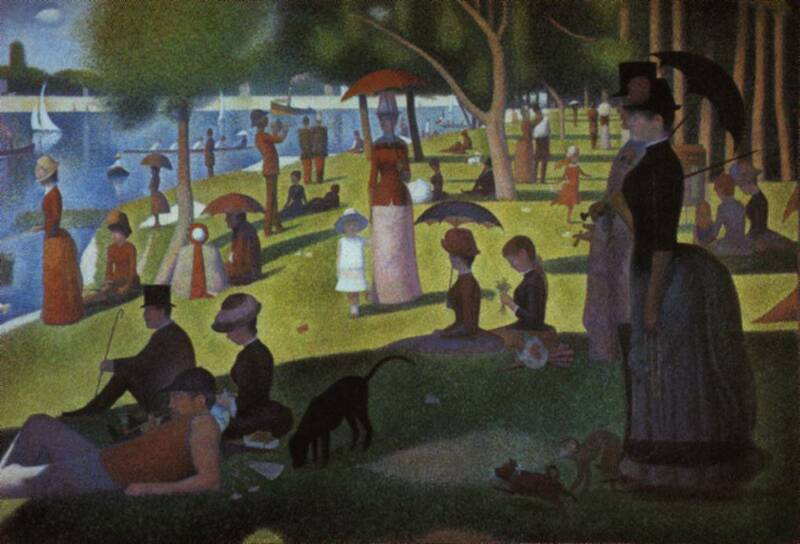 The men, women and children enjoying the sun in the public park on the island of La Grande Jatte in the Seine have the sort of fixity that a moving film acquires when it comes suddenly to a halt; they are frozen in their various attitudes. As a preliminary, Seurat made a number of oil sketches on the spot in a free and indeed Impressionist style. The finished work was intentionally different. The technique used is so interesting that it is apt to gain exclusive attention. One becomes absorbed in the geometric order that Seurat has imposed on the scene and this certainly is an opposite value to that of Impressionism. Pissarro, Signac and other artists attracted by the pointilliste method were somewhat led astray by the assumption that it opened up a new prospect solely in terms of translating light into colour. The comparison that has often been made between the Italian master of the geometrically-conceived composition, Piero della Francesca, and the Seurat of La Grande Jatte is justified in demonstrating the latter's essential direction. Absorbed though he was with theory, it would be wrong to assess Seurat as one unaware of the life around him. The statuesque figures to the right are the acme of bourgeois propriety though the lady may show pretensions to the eccentricity of `high life' by having a pet monkey on a lead. In many details it is a reality magically become unreal. A moment of charm is made lasting in the little girl running and the nearer girl bending over her bunch of flowers. The racing four that flashed across the canvases of Monet and Renoir at Argenteuil and other river craft here have the sharpness of a miniature. Under a blazing midafternoon summer sky, we see the Seine flooded with sunshine, smart town houses on the opposite bank, and small steamboats, sailboats, and a skiff moving up and down the river. Under the trees closer to us many people are strolling, others are sitting or stretched out lazily on the bluish grass. A few are fishing. There are young ladies, a nursemaid, a Dantesque old grandmother under a parasol, a sprawled-out boatman smoking his pipe, the lower part of his trousers completely devoured by the implacable sunlight. A dark-colored dog of no particular breed is sniffing around, a rust-colored butterfly hovers in mid-air, a young mother is strolling with her little girl dressed in white with a salmon-colored sash, two budding young Army officers from Saint-Cyr are walking by the water. Of the young ladies, one of them is making a bouquet, another is a girl with red hair in a blue dress. We see a married couple carrying a baby, and, at the extreme right, appears a scandalously hieratic-looking couple, a young dandy with a rather excessively elegant lady on his arm who has a yellow, purple, and ultramarine monkey on a leash. There was public resistance to the picture at first, Arsene Alexandre tells us: Everything was so new in this immense painting-the conception was bold and the technique one that nobody had never seen or heard before. This was the famous pointillism. When exhibited at the Independants, the work aroused sneers and indignation. There were outcries, Christophe goes on to say, but by standing its ground the picture's revolutionary character won out in the end. Its success was immediately hailed in La Vogue , to which Felix Feneon contributed a lively, logical, and well-informed article. Prior to its acquisition by the Art Institute of Chicago, the painting was owned successively by Seurat's mother, Maximillien Luce, Edmond Cousturier, and Charles Vildrac.